The Presidio San Agustin Museum in Tucson takes visitors back in time with a recreation of the Tucson Presidio built in 1775 by the Spanish. The museum also features a Sonoran row house as well as a prehistoric pit house. The Siqueiros-Jácome home is an example of a Sonoran row house, built close to the street with an interior courtyard. The adobe structure was built between the 1860’s and 1870’s and was occupied by Soledad Jácome until 1911, who supported her family by working as a seamstress. The home offers two excellent examples of packing crate and flat saguaro rib style roofing. Doors in the home were positioned to allow for the movement of air and cooling of the house. The Hohokam Indian pit house is located at the northeast corner of the presidio wall. Pit houses were named as such because the floor was located below the natural ground level. The presidio wall was most likely unknowingly built over the house’s location. It is assumed that a defensive lookout was located on this corner of the wall. In 1954, an excavation found the dwelling, which dates back to approximately 800 AD; evidence that Tucson is one of the oldest continually occupied locations in the United States. Over 2,000 years ago, the small pit house would have provided shelter for a family of four within the sapling-lined pit surrounding a central hearth. Other artifacts in the presidio include an 18th century cannon, a food and supply storeroom and a presidio-era barracks. Stations throughout the walled complex display soldier’s equipment, Native American and European Old and New World foods, cotton and wool, and other artifacts. Docents at each of the stations are available to provide information and answer questions. A Living History program staffs the site with costumed volunteers who re-enact the daily lives of soldiers, candle-makers, weavers, blacksmiths and merchants who would have lived within the walls of the presidio in Colonial times. The museum headquarters are located at the northwest corner of the fortified area. History: The Spanish military founded the Presidio San Augustin in 1775 when a fort was built at the site along the banks of the Santa Cruz River. The 11-acre complex was fortified by a thick adobe wall after falling victim to several Apache attacks, and was among the largest of the Spanish frontier. The structure was the foundation of what would eventually become the city of Tucson. 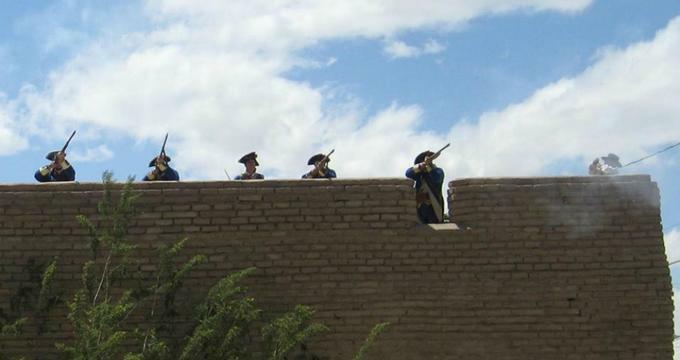 The massive adobe walls required continual maintenance, yet the fort survived multiple battles. In the mid 1800’s when Americans arrived, the walls of the fort were dismantled, and southern Arizona was transferred to the United States. The Tucson area was most rapidly settled after 1870 when minerals in the area were discovered and economic drivers moved from agriculture to mining. In 2007, the northeast corner of the fort was reconstructed following an archeological investigation of the site. The site is on the National Register of Historic Places. Ongoing Programs and Education: Docent-led 45-minute tours teach visitors about the lives of early Tucsonans. Special tours include the Presidio District Historic Walking Tour. This tour takes guests through the Tucson Museum of Art historic block and includes the Presidio and Old Town. The Turquoise Trail Walking Tour is a 2.5 mile guided historic and architectural tour, and includes an optional lunch. Blacksmithing demonstrations take place at the Presidio on the last Saturday of each month. Visitors may participate in firing the bellows as they watch blacksmiths work with metals. Group tours may be geared towards specific interests. Soldier Demonstrations include the firing of a musket. Textile themed tours include demonstrations of spinning cotton and wool, and weaving on a loom. A History of Medicine tour includes a presentation on medicinal plants, surgical procedures and pain mitigation from Colonial times. The Daily Life tour is recommended for teens. This tour offers into the jobs that teenagers and young adults would have held, what expectations were placed on them, and how they filled their daily lives with chores and games. The Children’s Hour provides an age-appropriate tour for 4-8 year olds. Children learn about the activities within the Presidio such as cattle-roping, gardening, and period games. Past and Future Exhibits: A Tucson Birthday Celebration will take place at the Presidio on August 2017 in celebration of the city’s 242nd birthday. Activities will include a flag presentation, cannon firing and folklorico dancing.